Poly Meat Storage Bags are perfect for storing ground meat in your freezer and using a Poly Bag Tape Machine seals the bags up tight. Store your ground meat like the butchers do this season in an air tight poly meat storage bag. 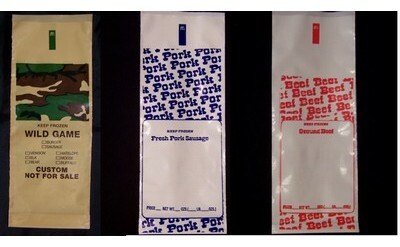 We carry Wild Game Meat Bags, Pork Sausage Meat Bags and Beef Poly Meat Bags in both one and two pound sizes. Poly Meat Bags keep air away from your ground meat which prevents freezer burn. Hog Ring Pliers by Weston Products. This spring-loaded hog ring tool is made of heavy-duty stainless steel with non-slip grips. They're handy for quick work in slippery environments. Quickly and easily seal your stuffed ground meat storage bags or close off the ends of the fibrous summer sausage cas.. This Poly bag meat packaging kit includes everything you need to package your ground meats and in less time it takes to freezer wrap it. Keep the air and light out with these quality made poly meat storage bags and easy to use poly tape sealer. The poly meat storage bags stack perfect.. These are quality food grade bags that can be sealed with tape, staple or twist-tie and will keep your ground meat air tight which is the key to preventing freezer burn. Marked with Beef and "Not for Sale" on the bag. Can be packaged by hand, sausage stuffer or straight from your meat grinder. .. These are quality food grade bags that can be sealed with tape, staple or twist-tie and will keep your ground meat air tight which is the key to preventing freezer burn. Marked with Pork Sausage and "Not for Sale" on the bag. Can be packaged by hand, sausage stuffer or straight from your meat g..